Auto insurers are achieving high levels of customer satisfaction when handling claims, but still struggle to transition claimants to digital claims reporting solutions, according to the J.D. Power 2018 U.S. Auto Claims Satisfaction Study. These findings are noteworthy in light of claim severity outpacing the decline in claim frequency, which is putting enormous pressure on traditional customer service and claims processing operations to create a more effective way to handle auto claims. Record-high customer satisfaction with auto claims: Overall satisfaction with the auto insurance claim process increases to 861 (on a 1,000-point scale), up 3 points from last year’s study and setting a record-high. The performance improvement is driven primarily by a 5-point improvement in the first notice of loss (FNOL) factor. Industry-wide improvement: Improvements in customer satisfaction are found across the board, with the gap between the highest- and lowest-ranking insurers shrinking to just 70 points, the smallest that gap has been since the study’s inception. Few customers adopting digital FNOL offerings: Although customer use of technology has increased over the past five years, 65 percent of claimants have received a digital status update, with the majority of that done in combination with offline status updates. FNOL currently has the lowest technology utilization, with just 11 percent of claimants filing a FNOL via digital channels. Customer satisfaction lower when using digital FNOL channels: FNOL satisfaction is lower among customers who submit their claim digitally than among those who report via offline channels (860 vs. 869, respectively). Mobile app usage can be a double-edged sword: The use of mobile apps in the estimation process, which allows claimants to submit photos or videos of their damaged vehicle directly to their insurer, is growing in popularity, with 42 percent of claimants using the technology. When insurers use those photos or videos, overall satisfaction surges to 871. However, when they do not use the photos or videos and still need to send an adjuster, overall satisfaction falls 29 points to 842. Currently, insurers rely on claimant-submitted photos and videos 53 percent of the time they are submitted. Erie Insurance ranks highest in overall customer satisfaction with a score of 891. 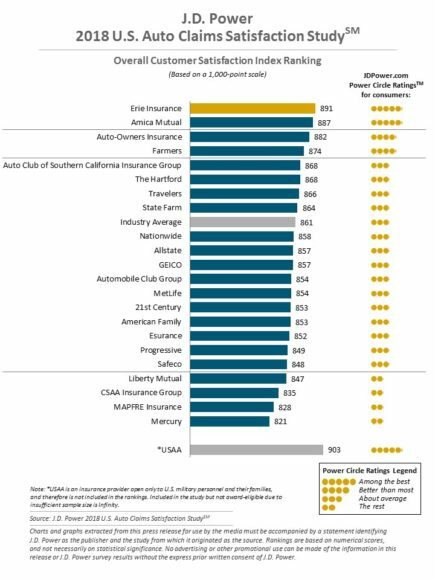 Amica Mutual (887) ranks second and Auto-Owners Insurance (882) ranks third. The 2018 U.S. Auto Claims Satisfaction Study is based on responses from 10,896 auto insurance customers who settled a claim within the past six months prior to taking the survey. The study excludes claimants whose vehicle incurred only glass/windshield damage or was stolen, or who only filed a roadside assistance claim. Survey data was collected from November 2017 through August 2018. For additional information about the U.S. Auto Claims Satisfaction Study, visit https://www.jdpower.com/resource/jd-power-us-auto-claims-satisfaction-study.